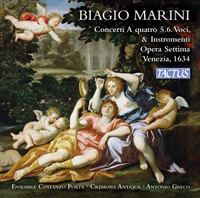 Description: This 1634 publication traces the transformation of the Italian madrigal from four- and five-voice pieces with basso continuo to modern six-voice works with obbligato instruments. 2 CDs. Texts available online. Coro Costanzo Porta, Cremona Antiqua; Antonio Greco.